Beth with sister, Jodi Metzger Romano, and her mother, Jane Metzger. The Phi Chapter is honored to announce a partnership with the Sigma Delta Tau Foundation to establish the Beth Metzger Gruber Scholarship to support the women of Phi-Penn State University. In 1917, seven courageous Jewish women established a sorority of inclusion, respect, and sisterhood. 100 years later we are honored to have inspiring women, like Beth Metzger Gruber, at the helm of our legacy. 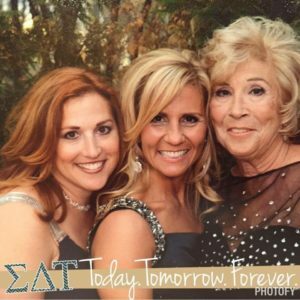 Beth is a proud Phi-Penn State Alumna, taking to heart the mission of Sigma Delta Tau and exemplifying her commitment to empowering sisters through her leadership, dedication and 25 years of service to SDT. 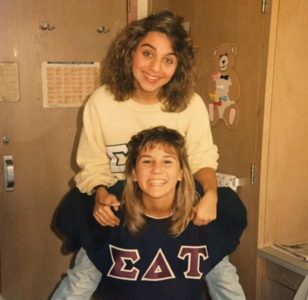 Beth was a leader both in the sorority and on the Penn State Campus. She served as a member of the Chapter’s Executive Board, Penn State Panhellenic Executive Board and the overall executive committee for THON. Beth is the first and only Phi Chapter sister to serve as National President. It is impossible to put into words the impact Beth has had on the sisters of Sigma Delta Tau. Please join us in celebrating all that Beth has accomplished as a sister and leader of Sigma Delta Tau. Our goal is to raise $30,000 to fully endow this scholarship by the 75th Anniversary of Phi Chapter, February 20, 2018. We have had nearly $15,000 pledged to date and would appreciate your help in achieving our goal! You can give online at: http://bit.ly/GruberFund or send your donation to the SDT Foundation, 714 Adams St., Carmel, IN 46032. Together, we can celebrate the incredible impact of Beth Metzger Gruber and ensure women like Beth receive the financial support to achieve their educational goals.